When I first planted tillage radishes in early October of 2009 in my Baltimore County, Maryland garden, the intent was to biodrill. That planting turned out to be too late and on ground that was not properly prepared. ( A fifty+ year pasture with sod six to eight inches thick.) 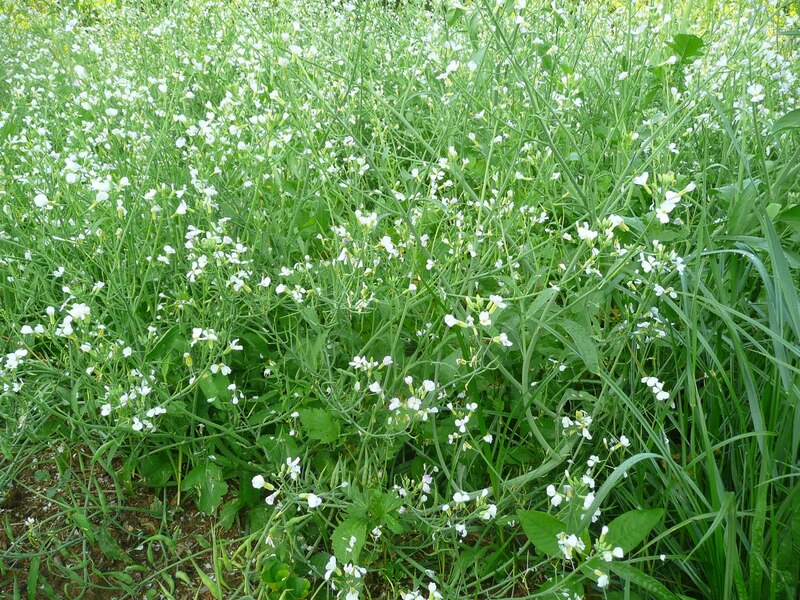 I planted again this spring, into soil tilled by a tractor, with two goals in mind – to learn more about the radish as a tiller and to provide a ground cover to control weeds. Little did I anticipate the spectacular display of blooms it would yield! For about 2 weeks now, the 17 x 17 foot plot has been a frothy cloud of white blooms. 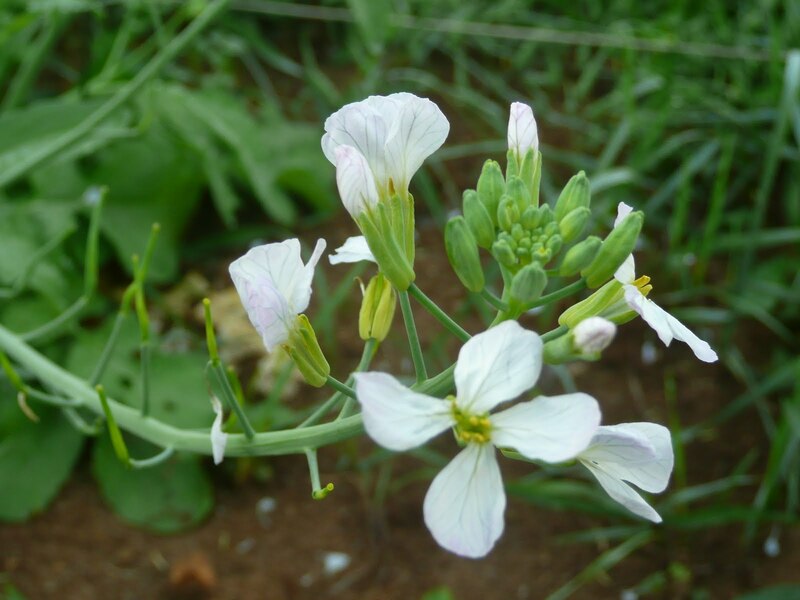 Some of the flowers are pale purple when they first open and then quickly fade to white. The long stems gently sway in the breeze and at midday, butterflies, white and yellow, flit and flutter along with a myriad of bees and other flying insects, all intent on gathering nectar and pollen. The overall effect is magical and promises to continue for several weeks more — I can see many buds yet to blossom. So enchanting is this vision that next year I will plant large swaths of tillage radishes in my flower borders — they are perfect for an informal cottage-style garden. And there’s even more goodness to report. Seeing the newly formed seed pods, I remembered reading about rat tail radishes that are grown specifically for their seed pods. So I nibbled on one to find out if they were at all palatable. They are so delicious it’s hard to describe. The slender pods are about the girth of a filet bean and one to three inches long. A pod from a radish sprawling alone with unlimited room to grow was tender, crunchy and a bit hot like a radish. Others from mid-patch, were sweeter with less heat. None of them were the least bit fibrous. They would be wonderful in a salad, as a garnish, and perhaps tossed into a stirfry for the last 10 seconds of cooking. The roots are still small and while not grown for eating in this case, no doubt they are tasty too. Tillage radish, where have you been? Why have the garden writers ignored you? Why don’t we see you at the farmers’ markets? And I’m still waiting for the tillage part when the plant dies and enriches the soil which is where all this started. What an interesting plant. Is it supposed to renourish poor soil? We live in the middle of an old cow pasture that was mostly grass. But the droughts we have had have killed some of the grass and now we have ugly weeds. I don't mind short well mannered weeds, like clover, but these are tall scraggly things. We tried fertilizing with no change. This might be what we need.